For other uses, see Congleton (disambiguation). Of unknown origin, the first recorded reference to the town's name was in 1282, when it was spelt Congelton. The element Congle could relate to the old Norse kang meaning a bend followed by the element the Old English tun meaning settlement. The first settlements in the Congleton area were Neolithic. Stone Age and Bronze Age artefacts have been found in the town. Congleton was once thought to have been a Roman settlement, although there is no archaeological or documentary evidence to support this. Congleton became a market town after Vikings destroyed nearby Davenport. Godwin, Earl of Wessex held the town in the Saxon period. The town is mentioned in the Domesday Book, where it is listed as Cogeltone: Bigot de Loges. William the Conqueror granted the whole of Cheshire to his nephew the Earl of Chester who constructed several fortifications including the town's castle in 1208. In the 13th century, Congleton belonged to the de Lacy family. Henry de Lacy, 3rd Earl of Lincoln granted the town its first charter in 1272, enabling it to hold fairs and markets, elect a mayor and ale taster, have a merchant guild and behead known criminals. In 1451, the River Dane flooded, destroying a number of buildings, the town's mill and wooden bridge. The river was diverted and the town rebuilt on higher ground. The legend earned Congleton the nickname 'Beartown'. During the Civil War, former mayor and lawyer, John Bradshaw, became president of the court which sent Charles I to his execution in 1649. His signature as Attorney General was the first on the king's death warrant. A plaque on Bradshaw House in Lawton Street commemorates him. Almost opposite the town hall, the White Lion public house bears a blue plaque, placed by the Congleton Civic Society, which reads: "The White Lion, built 16–17th century. Said to have housed the attorney's office where John Bradshaw, regicide, served his articles." The Old Mill and the town corn mill photographed in 1902; the mill became unstable and Roldane Mill was built on the site in 1923. The mill was demolished in 2003, and sheltered housing is being built here. King Edward I granted permission to build a mill. Congleton became an important centre of textile production, especially leather gloves and lace. Congleton had an early silk throwing mill, the Old Mill built by John Clayton and Nathaniel Pattison in 1753. More mills followed, and cotton was also spun. The town's prosperity depended on tariffs imposed on imported silk. When tariffs were removed in the 1860s, the empty mills were converted to fustian cutting. A limited silk ribbon weaving industry survived into the 20th century, and woven labels were still produced in the 1990s. Many mills survive as industrial or residential units. The town hall was designed, in the Gothic style, by Edward William Godwin. It was completed in 1866. 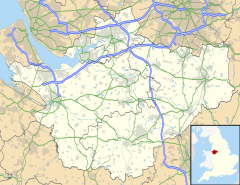 Congleton forms the central portion of the Cheshire East unitary authority, located in the south-east of Cheshire. Before the abolition of Cheshire County Council on 1 April 2009, Congleton had borough status (originally conferred in 1272). The neighbouring village of Buglawton was incorporated into Congleton borough in 1936. From 1974 to 2009, Congleton borough covered much of south-east Cheshire. For representation on Cheshire East Council, Congleton divided into two wards returning three members, Congleton East and Congleton West. All six seats are currently represented by Conservative Party Councillors. The town has an elected Town Council which was established in 1980. The town is split into two wards with 20 councillors elected every 4 years. The Congleton parliamentary constituency is a county constituency represented in the House of Commons of the Parliament of the United Kingdom. It includes the towns of Congleton, Alsager, Holmes Chapel, Middlewich and Sandbach. It elects one Member of Parliament (MP) by the first-past-the-post system of election. The current MP is Fiona Bruce of the Conservative Party — the constituency has always been a safe Conservative seat. The previous incumbent was Anne Winterton, who sat in parliament alongside her husband Nicholas Winterton, the MP for neighbouring Macclesfield. After they were judged to have broken MPs' expense rules in 2008 by claiming for rent on a second home owned by a family trust, both stood down at the 2010 general election; their joint statement cited the hectic life of politics as part of their reason for standing down. Mossley is sometimes classed as the wealthier part of town. Hightown is located before Mossley between town and the railway station. West Heath is a relatively new estate built in the early 1960s to the early 1980s. Lower Heath lies to the north of the town. There is also the town centre. In terms of physical geography, Congleton is located in the valley of the River Dane. To the south of the town lies an expanse of green space known locally as Priesty Fields which forms a green corridor right into the heart of the town – a rare feature in English towns. The principal industries in Congleton include the manufacture of airbags and golf balls. There are light engineering factories near the town, and sand extraction occurs on the Cheshire Plain, although much of the town is now a dormitory for Manchester and Stoke-on-Trent. Congleton Market operates every Tuesday and Saturday from the Bridestones Centre. Until about 2000 "Super Crystalate" balls, made of crystalate, were manufactured by "The Composition Billiard Ball Company" in Congleton. The company was then sold by its owner to Saluc S.A. the Belgian manufacturer of Aramith Balls. The name Super Crystalate was retained, but the manufacturing process was integrated into the standard process used for Aramith balls. The National Trust Tudor house Little Moreton Hall is four miles (6.4 km) southwest of the town. Congleton is home to the third oldest rugby union club in the country, dating back to 1860, although there have been periods when the club were not able to field a side. Currently fielding a mini and junior section and three adult sides, the club held the world record for the longest continuous game of rugby ever played; at 24 hours, 30 minutes and 6 seconds. The club has also pioneered the development of 'walking rugby' for more senior players and has re-established a Ladies team, having previously had two of its women players represent England. There is also a local football team, Congleton Town F.C., known as the Bears, who play in the North West Counties League. Their ground is at Booth Street. There are also two cricket clubs, Congleton CC and Mossley CC. There are two golf clubs in the town; the historic Congleton Golf Club which is an undulating nine-hole course with views over the Cloud End, and the 18-hole parkland course at Astbury. There is also a running club, Congleton Harriers, which meets weekly at Congleton Leisure Centre. The club organises the Congleton Half Marathon and in 2012 re-introduced the Congleton Quarter Marathon. Congleton Museum is on Market Square in the centre of town. It was established in 2002 and is dedicated to Congleton's industrial history. It also contains an ancient log boat and gold and silver coin hoards. Congleton Tourist Information Centre is on the town's High Street. The town also annually hosts a food and drink festival promoting locally sourced produce/cuisine and a jazz and blues festival which showcases acts from across the UK. There is one weekly local newspaper: the locally owned paid-for Congleton Chronicle. The evening newspaper The Sentinel, based in Stoke-on-Trent, also covers the town, although less so than in the past. Local radio is broadcast from nearby Macclesfield-based Silk FM, Signal 1 and Signal 2 from Stoke-on-Trent and BBC Radio Stoke, as well as Moorlands Radio in Leek and Canalside Community Radio in Macclesfield, both community radio stations. Congleton did have its own community radio station, the internet-only Beartown Radio, but this has now closed. Congleton railway station in 1986. Congleton is seven miles (11 km) east of the M6 motorway, connected by the A534. It is on the A34 trunk road between Stoke-on-Trent and Manchester, and the A54 to Buxton and the Peak District. The A536 links the town with Macclesfield, with the A527 linking the town to Biddulph and providing an alternative route to Stoke-on-Trent. Congleton railway station opened on 9 October 1848. It lies on the Manchester to Stoke-on-Trent branch of the West Coast Main Line. It was revealed in The Sentinel newspaper on 7 September 2011 that the ticket office could be closed as part of Government budget cuts. The Macclesfield Canal, completed in 1831, passes through the town. It runs 26 miles (42 km) from Marple Junction at Marple, where it joins the Upper Peak Forest Canal, southwards (through Bollington and Macclesfield), before arriving at Bosley. Having descended the 12 Bosley Locks over the course of about a mile (1.6 km), the canal continues through Congleton to a junction with the Hall Green Branch of the Trent & Mersey Canal at Hall Green. The canal is renowned for its elegant roving bridges, locally known as 'Snaily Bridges'. Congleton is one of few places in Britain where a road, canal and railway all cross each other at the same place. The nearest airport to the town is Manchester Airport, 20 mi (32 km) away. Policing in Congleton is provided by Cheshire Constabulary. The main police station is on Market Square. Statutory emergency fire and rescue service is provided by the Cheshire Fire and Rescue Service. Congleton Fire Station is on West Road, near the centre of town. Congleton has a small hospital, Congleton War Memorial Hospital, which was built by public subscription in 1924. The town is also served by Leighton Hospital in Crewe, Macclesfield District General Hospital and the University Hospital of North Staffordshire in Stoke-on-Trent. Utility firm United Utilities manages Congleton's drinking and waste water. Historically Congleton has seen a wide range of Christian church denominations. The Friends' Meeting House closed in 1741. The Wesleyan Methodist Trinity Chapel, in Wagg Street, was founded in 1766 and was rebuilt in 1808 and again in 1967; the Primitive Methodist Chapel was built in 1821 on Lawton Street, and rebuilt in 1890 on Kinsey Street; the Countess of Huntingdon's Connexion Methodist chapel was founded in 1822; the Congleton Edge Wesleyan Methodist Chapel was built in 1833 and rebuilt in 1889; the Wesleyan Methodist Chapel in Brook Street was built in 1834; the New Connexion Methodist Chapel in Queen Street was built in 1836 and closed in 1969; the Primitive Methodist Chapel in Biddulph Road was built in 1840; the Wesleyan Methodist Chapel in Rood Lane was founded in 1861 and rebuilt in 1886. The Unitarian Chapel in Cross Street was founded in 1687 near the Dane Bridge and in 1733 moved to Cross Street, with the present building constructed in 1883 and closed in 1978. The United Reformed Church (Independent/ Congregationalist) was built in 1790 on Mill Street, and then rebuilt in 1876 on Antrobus Street. Theodora Turner OBE ARRC (1907–1999), born in Congleton, nurse and hospital matron. Bluebells at Dane-in-Shaw Brook SSI. ^ "Congleton (Parish): Key Figures for 2011 Census". Neighbourhood Statistics. Office for National Statistics. Retrieved 13 March 2016. ^ Ekwall, Eilert (1936). The Concise Oxford Dictionary of English Place-Names (Fourth, 1984 Reprint ed.). Oxford. p. 120. ISBN 0-19-869103-3. ^ a b c d e f g "Congleton Museum website". Archived from the original on 21 July 2011. Retrieved 7 October 2010. ^ "The Domesday Book Online". Retrieved 7 October 2010. ^ "Congleton Bear Lyrics". Archived from the original on 30 September 2007. Retrieved 9 August 2007. ^ "John Tams information". Archived from the original on 19 August 2007. Retrieved 9 August 2007. ^ "Photographs of Congleton, Cheshire, England, UK". www.thornber.net. Retrieved 12 October 2018. ^ Callandine, Anthony (1993). "Lombe's Mill: An Exercise in reconstruction". Industrial Archaeology Review. Maney Publishing. XVI (1). ISSN 0309-0728. ^ "Your Councillors". 12 October 2018. Retrieved 12 October 2018. ^ "Town Council". Archived from the original on 13 February 2012. Retrieved 10 September 2011. ^ "MP pair to step down at election". BBC News. 25 May 2009. Retrieved 8 May 2010. ^ "Billiard and Snooker Heritage Collection - Billiards & Snooker balls". www.snookerheritage.co.uk. Retrieved 17 December 2018. ^ "Technical Information - Balls - Titan Sports & Games". titansports.co.uk. Retrieved 17 December 2018. ^ "Teams". Congleton RUFC. Retrieved 20 December 2016. ^ "About Us". Congleton Harriers. Archived from the original on 23 June 2016. Retrieved 20 December 2016. ^ "Congleton Half Marathon". Congleton Harriers. Archived from the original on 31 August 2016. Retrieved 20 December 2016. ^ "Astbury Mere Country Park". www.alsager.com. Retrieved 12 October 2018. ^ "Cheshire East Council – Astbury Mere Country Park". Archived from the original on 12 October 2016. Retrieved 12 October 2018. ^ "Congleton Food and Drink Festival". Retrieved 10 February 2016. ^ "Kidsgrove, Congleton and Sandbach railway ticket offices on hit-list - This is Staffordshire". Retrieved 12 October 2018. ^ "Welcome to Congleton Team Parish". Retrieved 12 January 2013. ^ "Places of Worship". Archived from the original on 4 January 2013. Retrieved 12 January 2013. ^ "Congelton Baptist Church". Retrieved 12 January 2013. ^ "The Methodist Church – Dane and Trent Circuit". Archived from the original on 5 January 2013. Retrieved 13 January 2013. ^ "New Life Church". Retrieved 13 January 2013. ^ "Cross Street". Retrieved 13 January 2013. ^ "Congleton Spiritualist Church". 2011. Archived from the original on 28 August 2012. Retrieved 13 January 2013. ^ "St Mary R C Church". St Mary R C Church. Retrieved 12 October 2018. ^ "Minshull Vernon United Reformed Church". 2013. Retrieved 13 January 2013. ^ a b c "Congleton". genuki. 1996–2012. Retrieved 13 January 2013. Head, Robert (1887). Congleton Past and Present. Robert Head. Wikimedia Commons has media related to Congleton. "Congleton" . Encyclopædia Britannica. 6 (11th ed.). 1911. Welcome to Congleton — dedicated tourism website for the Congleton area.